Hello everyone and thank you for visiting…….Make a memory every day, and don’t apologize for who you are! March is one of my favorite months. March is Health Month. Many of you know that I take care of my dad, who is 90 years old. He has been missing our mother so much lately I can’t even explain it to you. Now I will tell you that my dad is in a wheelchair 90% of the time. While he was crying one day, I bent over to give him a hug. The hug lasted for a few minutes, my back was straining to actually give him a simple hug. It was then that I realized how few HUGS that my dad really gets. It made me think of all of the elderly people in wheelchairs, our Veterans, children and adults that have been stricken with debilitating muscular diseases, etc. that are missing our on getting or giving a HUG! 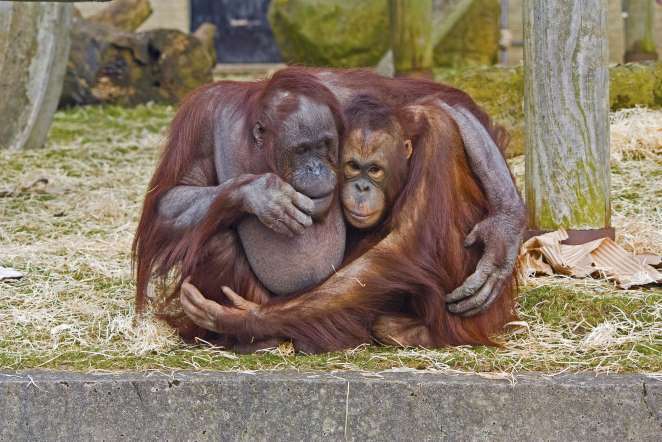 Just one Hug will boost your endorphins and make you feel extremely happy and them too. So give a hug to someone that can’t stand on their own. It is extremely hard for them to initiate the gesture. I had a friend of mine ask me last week about Essential Oils. Essential Oils can be used as Aromatherapy, Ingesting, or as a Messaging oil. Some of you may already use them on a daily basis. Essential Oils go back many, many years. What is an essential oil? An essential oil is a liquid aromatic compound, which extracted from specific parts of the plants such as seeds, flowers, leaves, bark, wood, roots or peel. They have been known to treat many ailments, soothe muscles, calm nerves, and put you in a better spirit. One of the most common used is Lavender. It induces a very calming effect on us. Organic Coconut Oil, I use this for almost everything, Cooking, hair, skin, and nails. Organic Lavender Essential Oil, I use a few drops in my bathwater, and on linens for a good nights sleep. Rescue Remedy Essential Oil, I use this to relieve stress. It is made from Cherry Plum, Clematis, Rock Rose and Star of Bethlehem. It restores a sense of calm. It is gentle and safe for the entire family to use. (do not use if you are pregnant or breastfeeding) just 4 drops under your tongue. Organic Metabolic Essential Oil Supplement, I use this as a way to control my hunger. Ingredients: Grapefruit Peel, Ginger Root, Lemon Peel, Peppermint Plant, and Cinnamon Bark. (dilute 4 drops in four ounces of liquid) daily. Note: Essential Oils can be harmful to children, women who are breast feeding and pregnant. Please read the label before using any essential oils. My March Madness!- My seeds have sprouted and beginning to grow. 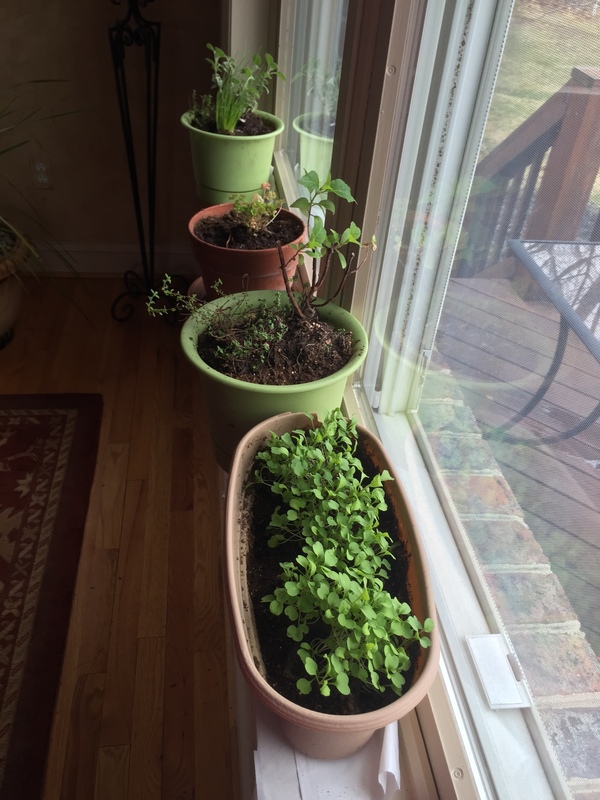 Arugula, Basil, Thyme, Dill and Rosemary. It is so easy to do. Plant the seeds with plenty of water, put them in a dark warm place. After about 2 days you will see them sprouting. Place them in a sunny window and watch them grow. Transplant when the weather gets warm or place them in decorative metal barrels or buckets and put them on your deck or yard. That way they are easier to bring in for the winter! Arugula, Dill, Thyme and Basil. 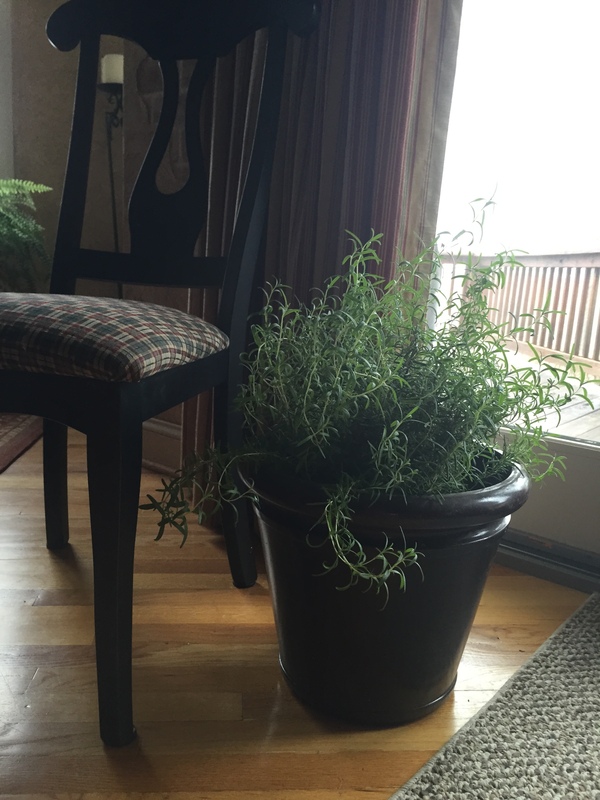 My Rosemary from last year! 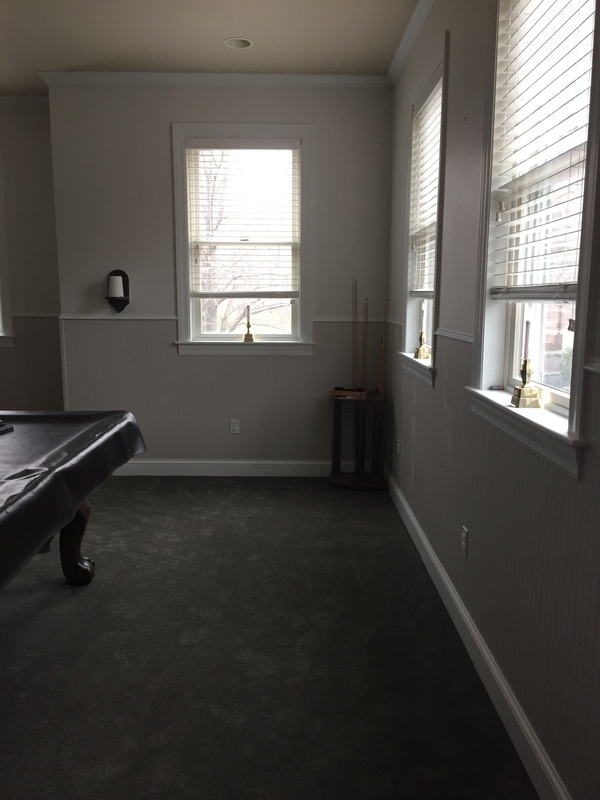 Finished Family Room- As promised! Turned out really nice. A fresh coat of paint and some new carpet! ← What price do you put on your health? Make positive changes, there’s No Deadline!